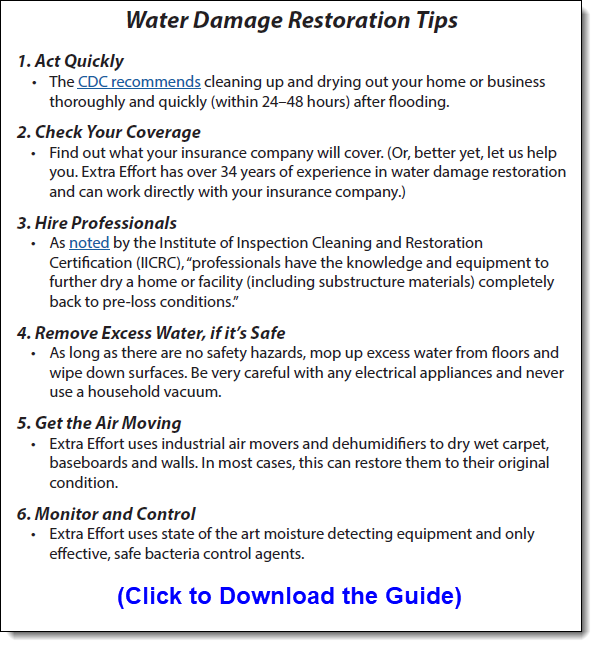 Earlier this month, I walked through Your Fall Checklist to Avoid Common Water Damage Restoration Emergencies for preventative measures. However, with WCPO calling for Near-record rainfall possible for Halloween tonight and the National Weather Service calling for a Flood Watch in Butler County, it’s worth revisiting what to do in a flood emergency. As noted in the printable guide to the right, the keys are to act quickly, be safe, and make sure the clean up is done correctly. No matter what, do not enter a flooded area if the electricity is still on as this can be a very dangerous situation. While you do need to act quickly, it is worth waiting for a professional if you are unsure of the risks. As noted by the CDC, there is sufficient evidence to link indoor exposure to mold with health issues so once the water has been removed it’s time for the behind-the-scenes clean up. Drywall, insulation, wood doors, trim work, carpets, pad, and sub-floors all can absorb water and need to be addressed quickly to prevent mold. Our technicians are trained to address important issues including mold, mildew, stain and moisture removal. We use state-of-the-art moisture-detecting equipment and safe bacteria control agents to do everything possible to minimize the loss. As a father/son company we offer personalized service with large-company capabilities to ensure that your home is safe and whole. Hopefully you won’t need us, but if you do please call me at the number below.